thm photo of Casall's final win. "Casall finished his illustrious career on home – Holstein – soil, winning the five star Grand Prix of Hamburg and was immediately retired…"
Read the newly updated article on Casall on horsemagazine.com, in their Great Stallions series. The Great Stallions archive is a tremendous resource for breeders, with detailed articles on the foundation sires of all the European warmblood breeds. The article on Casall spans his career, and has been updated to describe his final win and retirement. Other new topics on horsemagazine.com include Andrew Nicholson's views on cross country schooling causing accidents; and a tribute to François Robichon de la Guéinière, the Greatest of the Old Masters of dressage. Click here to read about Casall. 07/09/2017. The dressage news website eurodressage has reported that the Danish Equestrian Federation and Danish Warmblood and Trakehner Society have announced that the young horses have been selected to represent Denmark have been chosen for the 2017 World Championships for Young Dressage Horses. Devon, PA – Dressage at Devon brings horse breeders, riders, and enthusiasts together from all over the world to watch and compete in this ancient equestrian discipline. This year, Dressage at Devon will take place on September 26 through October 1, 2017 at the historic Devon Horse Show Grounds in Devon PA. There is something for everyone here – from exciting equine performances, to gourmet food and charming outdoor cafes, to more than 90 vendors offering exclusive apparel, fine arts, jewelry and antiques – for equestrians and non-equestrians alike. New this year is a Dales Pony class, sponsored by the DAD Committee. One of the United Kingdom’s native mountain and moorland pony breeds, the Dales Pony is known for its strength, hardiness, stamina, courage, intelligence and good disposition but population numbers are low. It is considered “critical” by Rare Breeds Survival Trust and “threatened” by the Livestock Conservancy. The Breed Show will also feature a Thoroughbred Class, sponsored by Jenn Sauder, in addition to more than 20 other breeds. The 2017 prize list is available at http://dressageatdevon.org/pdf/DADPrizeList.pdf. The competitor’s tent received a great reception last year and so it’s back for 2017, sponsored by Devoucoux, a top-of-the-line custom-make saddle brand, originating in the Basque Village of Sare in 1985. DAD is committed to providing opportunities for young riders. The categories include Children ages 12-14, Juniors age 14-18, and Young Riders age 16-21. Junior and Young Rider tests take place on Friday and Saturday, with their wonderful Freestyles on Sunday. The Junior and Young Riders classes are Qualifiers for the North American Junior and Young Riders Championships. Additionally, there is the Children’s Team Test on Saturday and the Children’s Individual Test on Sunday. These riders represent the future of dressage. Selfie Scavenger Hunt. Take a photo at our special spots, bring the photos to the Gift Shop and receive a DAD gift. Stick Horse Competition. Ride down the centerline in the Dixon Oval on your favorite steed. Bring your own or make one with us. It is not uncommon for volunteers to come year after year to enjoy the show and the camaraderie. But more hands are always better. To volunteer for one or multiple shifts, sign up at www.dressageatdevon.org under Volunteers. If you have questions, email Penny@thehorsewriter.com. Dressage at Devon (www.dressageatdevon.org) has been a premier North American Equestrian event since its founding in 1975. It combines world-class dressage competition and the world’s largest open breed show with the international Fall Festival show and special activities for the entire family. The six-day event attracts hundreds of riders from around the world and thousands of spectators. Dressage at Devon is a 501(c) (3) PA non-profit organization, benefitting equine education. 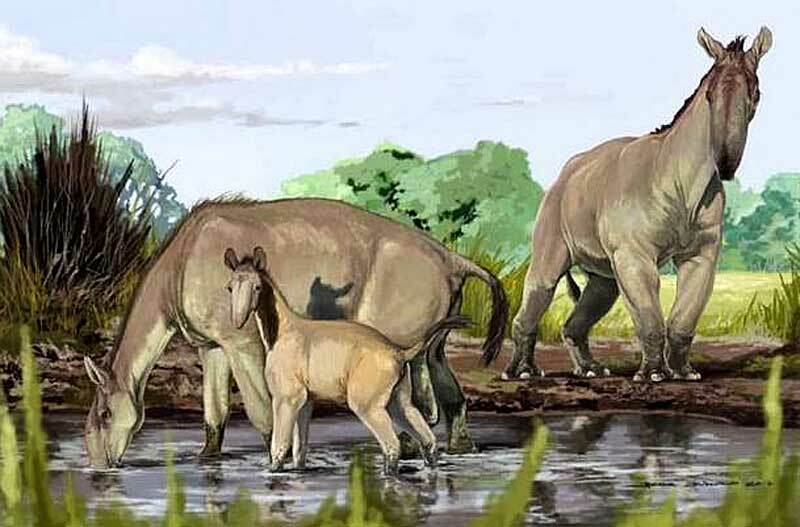 Here's an interesting article on a New Zealand website about a strange relative of the prehistoric horse. The Ice Age mammal lived in South America, and its bones have been a real puzzle! DNA analysis has now placed the animal in the same group as horses, rhinos and tapirs. Macrauchenia patachonica was a pretty big critter, much bigger than prehistoric horses, but the weird thing is that it breathed from the upper part of its face. If a horse could do that, it could stick its whole muzzle in the water tank and still breathe! Above is an artist's drawing of what the animal might have looked like. I try to limit my posts to topics of specific interest to breeders, but I find it fascinating that your horse, far back in its pedigree, is a distant cousin to this strange animal.